I like stuff. One day I would like a house full of interesting, bright, and fantastic things. Here’s a selection of the random things I’ve found on the internet that I aspire to eventually obtain. This is the most fantastic image ever. The original topic of the photo was the giant elastic band ball, but what’s in the background that got the most comments – a giant scrabble rug! I’ve found it here for $100, and I’m pretty sure within the next year I’ll have bought it, I can’t help it, it’s a giant scrabble rug for goodness sake! Something to match that sir? How about this? 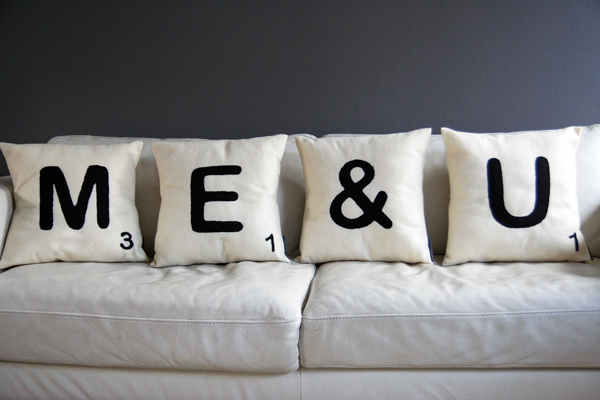 Alright, maybe my house will look a bit too ‘wordy’ but these are so adorable none the less. Well that’s all, I think I’m going to start posting more about what I randomly find, as some of them are too nice not to share. I found these through a number of different websites. The main two being 9gag & Stumbleupon – make sure you check them out if you haven’t!